An earlier pioneer of the amateur journalism movement, Charles. W. “Tryout” Smith, is being honored in September with a ceremony capped by the placement of a headstone at his relatively obscure Haverhill gravesite. Smith began publishing the Monthly Visitor from his Haverhill home in 1888, mostly to help his brother Frank raise money after his brother became too ill to work. The Smiths turned out 118 issues, ending a decade later. It was Smith’s retirement publication, however, “The Tryout,” that earned him his nickname and place in history, according to WHAV historian David Goudsward. Securing a grant from The Aeroflex Foundation, Goudsward contracted with Atwood Memorial to craft a headstone in Haverhill’s Hilldale Cemetery. 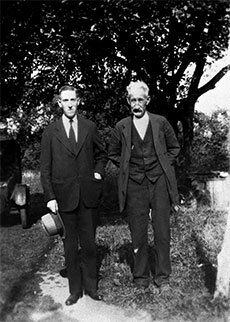 It will be dedicated Saturday, Sept. 22, to the man who gave so many prominent authors—including Howard P. Lovecraft—their starts. Taking place during Essex Heritage’s Trails & Sails, a display of Smith’s work, release of a commemorative booklet and self-guided tours with Lovecraft significance take place between 1 and 4 p.m., at Buttonwoods Museum, 240 Water St. Sites include the Haven Garrison House and Pentucket Burial Ground. Dedication of the headstone takes place at 6:30 p.m., at Hilldale Cemetery. Tryout Smith and Lovecraft facing Water Street. The tip of Hales Island in the Merrimack is visible behind them, October, 1931. The first issue of the Tryout was published in 1914 from a shed in the yard of Smith’s Groveland Street home. He was 62 years old, mostly deaf from his years working in the mill and suffered such poor vision that manual typesetting was a chore. The name Tryout was selected because he wasn’t sure if he could see well enough to operate the press, so he thought he’d try it out. Smith gave the press an extended tryout, hand-setting 300 issues from 1914 to 1944. The Tryout was successful in encouraging new talent. Besides Lovecraft, fledgling writers that gained confidence in the pages of the Tryout were publisher/writer August Derleth, curator and freethinker James Morton, novelist Edith Miniter, philatelic expert/editor Willard O. Wylie, syndicated children’s author Myrta Little Davies, anthropologist R.H. Barlow,; regional humorist W. Paul Cook, and many others.